Next week I have the distinct honor to join world leaders to SET THE GLOBAL AGENDA in the fight against online sexual child abuse in the digital world. 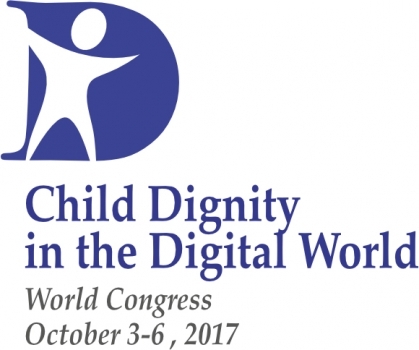 The "Child Dignity In the Digital World" World Congress will take place in Rome, Italy and is the first World Congress of its kind that brings together international leaders and scholars under the theme of Cyber Protection, Cyber Education, Cyber Responsibility. Just think - this is the World Series of Internet safety experts meeting to discuss what we at Enough Is Enough® devote our hearts, souls and lives to - preventing the sexual exploitation of kids online. This event is so historic that it will conclude with an audience with Pope Francis in a ceremonial signing of the “Declaration on Child Dignity in the Digital World” by Heads of Government in attendance! I am confident that progress, resulting in change, will be made! Please join me on Facebook live and Twitter as I share with you in real time the details of the Congress. In the meantime, I need to boldly ask you for your help. Participating in this World Congress does not come without significant financial cost. Would you be willing to offer your financial support to help send me to Rome to fight to protect the innocence and well being of the children you love and children worldwide? Your support will also cover our efforts to implement next steps to further the global agenda that we formulate as a result of the Congress. Please, consider making a donation of $50, $75. or more to help offset the expense of this historical opportunity. With your financial contribution, I will know that you're standing there right beside me, even though we'll be thousands of miles apart. On behalf of your loved ones and mine, I truly thank you for your support. Event details can be found here. View Donna's statement on the Congress here. Enough Is Enough®® is a national bi-partisan non-profit organization who has led the fight to make the Internet safer for children and families since 1994. EIE's efforts are focused on combating Internet p*rnography, child p*rnography, sexual predation, and cyberbullying by incorporating a three-pronged prevention strategy with shared responsibilities between the public, Corporate America, and the legal community. Donna Rice Hughes’ press kit can be found here.